Few games are as deserving of the descriptor “epic” as much as those in the “God of War” series. It plays like a Japanese-developed hack-and-slash but is presented with the grandeur of a Western blockbuster, and that formula is precisely why each game in the series has done well both critically and financially. But like every successful franchise, there comes a time where the formula needs tweaking and the past needs to be redressed. Kratos, the series’ protagonist, has killed just about every single Greek God and Titan (! ), but he was never too much of a character as much as he was an unadulterated vessel of rage. The soft-reboot of the series, the (uninspiringly named) “God of War” continues the Ghost of Sparta’s tale as he tackles his biggest hurdle yet: Transitioning from Kratos, God of War, to Kratos, Dad of Boy. 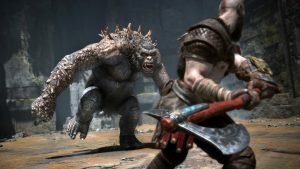 Creative director Cory Barlog has put in considerable work in making the new “God of War” as foreign to series newcomers and veterans. This is good. In the undisclosed amount of time between “God of War III” and its 2018 sequel, Kratos somehow made his way from Greece to Scandinavia, grew his beard out and settled down. The “how” he got here, as well as the “why,” are questions for another time. Along with many, many other ambiguities throughout the lore the game acknowledges, this mystery is one of new joys the series offers. The opening frames of “God of War” introduce us to so much of the series’ newly established identity, one that Kratos himself is fiercely fighting to distance his past, and his son, from. Boy, Kratos’ son whom he refers to once a blue moon by his birth name, Atreus, is an exciting new character this game introduces. 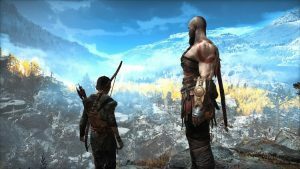 In many ways, Atreus makes the game what it is and will compel players to see their journey’s end. Their quest is a simple one: Scatter the ashes of Kratos’ betrothed, Atreus’ mother, on the highest peak in the Nine Realms. Along the way, the two encounter a few friends and a lot of enemies, though it’s the relationship between father and son that make those encounters meaningful. There really is too much to say about “God of War’”s story that can not be done justice in any sort of review. Play the game, experience it firsthand. Just when you think the game cannot get any more exciting, developments occur and emotions swell to the brink of explosion. At one point, “God of War” flips the castle and you realize that everything you’ve done is merely a portion of the monumental task ahead. It’s been said once but I’ll say it again to reiterate: “God of War” is a beautiful story that brings out the human in Kratos. Christopher Judge’s voice as Old Man Kratos is a commanding bass that would make the devil curl up in a ball, and the young and always promising Sunny Suljic continues to show immense talent as the blissfully naive Atreus. Spending time with them in conversation is rewarding and unlocks layers to their relationship. Very early into the game, Kratos tells Atreus not to be sorry, but to be better. It’s a line that boldly speaks to Sony Studios Santa Monica’s legacy and the places a series as defiantly brutal as “God of War” can go. They never needed to be sorry for their games — they’re excellent titles — but they could always improve, and the new “God of War” encapsulates that improvement in nearly every fathomable way. It’s not perfect, but it’s a masterpiece of a video game from a technical, writing and gameplay perspective that will hopefully (but unfortunately won’t) send a ripple through the gaming industry beckoning for character-driven single player games. The history of great games is built on taking pre-established ideas and innovating upon them. If we’re judging “God of War” solely on the basis of originality, it’d fail harder than an ESRB supercut of the PG moments in the series. There’s so much that has already been said, but Santa Monica Studios clearly drew a lot from Naughty Dog’s “The Last of Us,” something Barlog has openly discussed. But rather than splitting hairs about the way they’re informed by “The Last of Us,” the simplest of differences between them reveal how singular each title is. And for what it’s worth, the didactic father-son story has been told too many times to count; the particular dynamic “God of War” explores hits many of the same beats as others, but its epic tale of Gods and the grueling process of coming to terms with your past make it exceptional. Shifting combat from past “God of War” games has been a seamless evolution that retains the intensity, but Old Man Kratos’ speed is not what it once was. One of the biggest differences the game introduces is the lack of a jump button; occasionally you’ll be prompted to leap over an edge or climb to a wall, but otherwise your mobility is purely on one plane. Replacing the iconic Blades of Chaos from previous installments is the Leviathan Axe, a frost-elemental weapon that rivals the blades on impact. Attacks are swift and brutal, and though the game doesn’t run on 60 FPS and Kratos is slower this time around, combat is absolutely riveting. Playing “God of War” on its hardest difficulty is a Herculean task that requires precise attacks, feline reflexes and expert timing to parry foes using Kratos’ collapsible shield. “God of War” is pretty. It is very, very, exceedingly pretty and it’s hard to believe that what you’re playing at times is not one continuous cutscene. Here’s a challenge: Take a screenshot, and ask someone unfamiliar with the game to determine if what they’re seeing is a cutscene or actual gameplay. It’s that gorgeous. Naturally, there’s some hiccups, as especially in the first quarter of the game there is more attention paid to beautiful presentation. There are some aspects of the visual department that clearly were less favored than others, like certain environments having poorer textures and lighting. But even then, the graphical fidelity in these scenes are nothing short of breathtaking and leagues ahead of most the competition (operative word being “most” because “Horizon Zero Dawn” exists). Volumetric lighting, particle effects and physical rendering of objects like Kratos and Atreus’ equipment (that beard though!) lend the photorealistic authenticity that every single gamer will find something to ogle at. Featuring a single-camera perspective that never once cuts, the gimmick holds up phenomenally to provide the game the jaw-dropping feel its content requires. It would be nice, though, if there was an option to make the game run at 60 FPS at the expense of graphical fidelity, as with Team Ninja’s “Nioh,” since the action in “God of War” can be so breakneck. Because of how cinematic the game is, it’s understandable that it would need to be accompanied by a sound design that communicates every awe-inspiring visual and deep, viscous attack to your ears. Famed composer Bear McCreary helmed the game’s larger-than-life score which amps up everything from desperate battles and colossal boss fights to the serene ambience of the Norse wilderness. You won’t catch the acclaimed theme song from the original series, but in its stead are equally swelling orchestrations. Of course, what would a “God of War” game be without the sound of flesh razing and bone breaking? It’s got that, and it delivers it in spades. And it’s in the collision of sound and visuals that a story so simple in mind but epic in execution takes form. Video games are more than the sum of their technical parts, but it’s impossible not to take a step back from the towering achievement of Santa Monica Studios. Verdict: Though early in the year, “God of War” is top contender for game of the year. It’s the perfect package: Intuitive combat with a rich amount of light RPG-like detail; an emotional story that spells a bold new direction for the series; and a technical marvel that testifies to the power of the PS4. Buy this game and do not hesitate.